Synopsis: Tales To Astonish #2 reprints Sub-Mariner #2 (June 1968). The issue opens with the Sub-Mariner destroying the Arctic Circle base of his foe Destiny following their battle in the previous issue. Namor departs to pursue the escaped villain, wondering if he can draw upon his uneasy truce with the Fantastic Four for assistance in finding Destiny. Elsewhere, Plant Man curses his luck as he spots Black Bolt flying over his submarine. The Inhuman's monarch joins Medusa, Karnak, Gorgon and Triton on the shore of a nearby island and they set out to investigate the suspicious submarine. 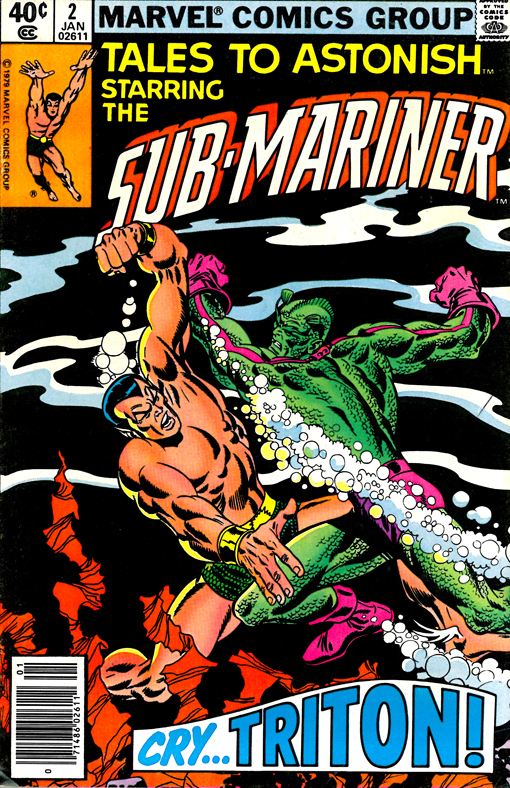 Triton dives beneath the surface and Plant Man manages to provoke a fight between the aquatic Inhuman and the Sub-Mariner. They go blow-for-blow at length, but just as Namor is about to beat Triton, the two are are captured by Plant Man who escapes the rest of the Inhumans in his submarine and sets a course for London, England where he plans to unleash his next attack. During an interlude in this issue, Lady Dorma agonizes over whether Prince Namor is actually dead while the citizens of Atlantis start to evacuate their destroyed city.